Congress General Secretary incharge of eastern UP Priyanka Gandhi will campaign in the seats where the party has high probability of winning. Congress has declared candidates for 64 of 80 LS seats in UP and a close look at them clearly indicates its tactical support to the Mahagathbandhan. Congress, which was pitching very aggressively in February and March in Uttar Pradesh, is now trying to tactically help the SP-BSP combine win in constituencies where the grand old party doesn’t see a chance of winning. Congress has declared candidates for 64 of 80 Lok Sabha seats in UP and a close look at them clearly indicates its tactical support to the Mahagathbandhan. “There is nothing new in that,” a state Congress leader told ET. “We had focused on 22 odd seats and had planned to leave others for the grand alliance.” So, while BSP supremo Mayawati and SP leader Akhilesh Yadav both are now attacking Congress in their election rallies, the targets of Congress’ campaign continue to be BJP and Prime Minister Narendra Modi. Congress general secretary incharge of eastern UP Priyanka Gandhi will campaign in the seats where the party has high probability of winning, said the leader quoted earlier. Over all, going by its list, Congress candidates will help the grand alliance in over 26 seats. The party released a list of nine candidates from the state on Saturday, and five names in the list would directly help the SP-BSP alliance. Take the case of Ghazipur. Former Azamgarh MP Ramakant Yadav, who left BJP to join Congress recently, wanted to contest from Ghazipur considering the population of Yadav voters. But the party leadership told him that he should look for another seat. There were two reasons, a party leader said. One, the party didn’t want to create any trouble for BSP candidate Afzal Ansari, who is banking on Muslim, Dalit and Yadav votes. Also, Congress feared that a Yadav candidate in Ghazipur could trigger anger among Muslims across east UP, the person said. Afzal Ansari is elder brother of jailed don-turnedpolitician Mukhtar Ansari. Congress’ candidate from Ghazipur is Ajit Kushwaha who is expected to help Ansari win, because Kushwahas form a good chunk of voters in Ghazipur and they generally vote for BJP. “Whatever votes Ajit gets will damage the BJP only,” a local leader said. Similarly, Congress has fielded Shiv Saran Kushwaha from Jhansi and Shiv Kanya Kushwaha from Chandauli. While Shiv Saran is the brother of former BSP leader Babu Singh Kushwaha, Shiv Kanya is his wife. Both the candidates are expected to take away a portion of Kushwaha voters to make it easier for the grand alliance. In Ambedkar Nagar, Congress has fielded Ummed Singh Nishad, husband of former bandit Phulan Devi. “Nishads either vote for the BJP or to their caste in this region,” said a party leader. In Salempur, Jaunpur and Mathura, Congress has fielded Brahmin candidates who may not win the election but would help increase the party’s vote share among the upper castes, thus making it easier for the alliance candidate. Former MP Rajesh Mishra is contesting from Salempur, Devbrat Mishra from Jaunpur and Mahesh Pathak is being fielded in Mathura. In Ghaziabad, which went to polls in the first phase, Congress had fielded Dolly Sharma, a local Brahmin candidate, against BJP’s V K Singh. Congress is also planning to field a Brahmin from Gorakhpur. 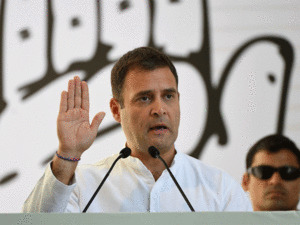 In the first phase, Congress had also fielded Harendra Agarwal from Meerut, Harender Malik from Kairana, and Arvind Singh from Gautam Buddh Nagar. All these candidates were aimed at dividing BJP votes to make it comfortable for the SPBSP alliance, sources said. In Lalganj reserved seat, Congress has fielded Pankaj Mohan Sonkar against sitting BJP MP Nilam Sonkar. Sonkar is a sub caste of Pasi and forms the good chunk of voters in Lalganj.